NASA tests more tech that will help take us to Mars, apps get some important updates, and PlayStation 4 gets a new special edition console. 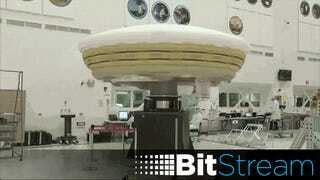 All the news tidbits and rumors you missed yesterday, here on BitStream. This spinning piece of scifi is NASA’s low-density supersonic decelerator (we’ll work on the name) specifically designed to deliver large payloads to the surface of Mars. Yesterday, NASA preformed an important spin test in Hawaii to make sure everything is good to go for the summer’s upcoming flight test. Alcatel’s new smartwatch is now available for pre-order for $150, but here’s the kicker—It’s OS-agnostic. Great, like I need an irrational fear of something else. Thanks, science.